Pictured at the launch of this year’s Croí Christmas card pack campaign ‘Posting a positive thought this Christmas’, are L-R Esther Daly, Salthill postmistress, Seona Joyce, Croi and local heart patient Tony O’Connor. 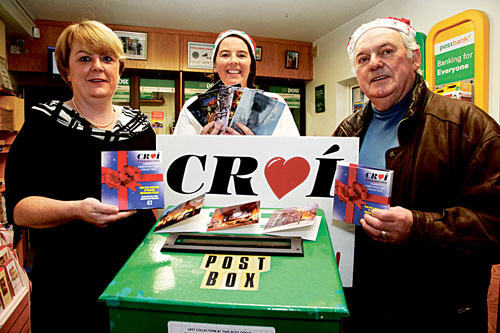 Heart charity Croi has today launched its 2009 Christmas card pack selection. Synonymous with Christmas in Galway the Croi Christmas card selection is once again unique and exciting. This year’s pack includes a selection of stunning photos of Galway and west of Ireland Christmas scenes. The pack features streetscapes of Quay Street, Courthouse Square, internal photographs of Galway Cathedral, the crib at the Augustinian Church, as well as a Christmas depiction of Tuam Cathedral. The selection also includes images of Croagh Patrick and other snowscapes. Despite the doom and gloom of recession, Croi is appealing to people to keep up the Irish tradition of remembering loved ones, friends, and colleagues at Christmas by sending Christmas Cards. The Christmas card project is one of the biggest annual fundraisers for the charity. Essential funds to support Croi’s vital work, through prevention and lifestyle change programmes in the community, are funded from the sale of Croi Christmas cards. Each pack of cards includes 12 unique designs and retails at €7 per pack. Packs are available in a number of outlets in the city and county and also from 091 544310 or www.croi.ie All proceeds from the sale of Croi cards will go directly towards the fight against heart disease. Page generated in 0.1677 seconds.